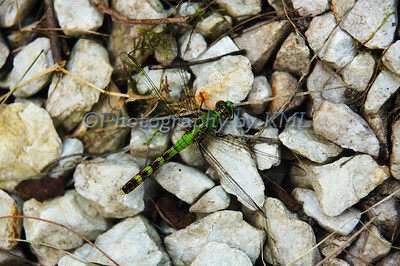 This was one of the prettiest dragonflies that I have seen. When I first saw it, it was on a leaf in the garden, and I almost missed him because he matched that leaf so well. So, I followed him around until he landed on something that he stood out against. It took a while, and I guess he was tired, because he stayed quite a while on these rocks. He didn't fly away as I closed in on him. This was the closest I could get with the lens I had on the camera - not my macro one which would have done a great job with his details. He was beautiful, and I have yet to see another one like him - perhaps this summer I might get a chance. My eyes will be peeled. The animals at the county fair are always a big hit in the autumn. And the that first weekend in September was a steamy one. 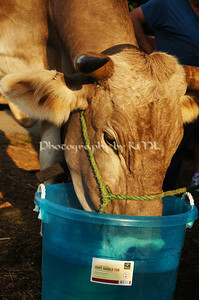 This thirsty cow was so happy to get back to her stall after the showing. She drank all the water and the bucket was promptly refilled for her. She didn't even mind me going right up to her to snap the photo. We couldn't wait to get out of there ourselves and head straight to the lake for a swim. Most times we are bundled up against the chilly fall air, but that year was a hot one for animals and people alike.